Note: I have already made 2 posts, one regarding the novel, and the other regarding euthanasia. In the novel, the story is quite lengthy, detail and complex (in terms of characters). Clearly, as someone who has read the book, I was disappointed at the lack of details that could have enriched the primordial intentions of the author. For instance, Louisa’s low-income background and struggle to financially sustain her family was completely sugar-coated. In the film, Louisa’s eccentric fashion style and lovely home do not suggest any struggles whatsoever, other than the references made by the characters every now and then. This film had to be a shortened version of the book, due to time constraints, but I oftentimes ended up feeling as if the film were a ‘collection’ of scenes taken from the book, rather than a beautiful chronological sequence of events. Maybe if I hadn’t read the book before, I wouldn’t have been so critical about the film now. I loved that Emilia Clarke played Louisa. I love Emilia’s portrayal of Khaleesi in Game of Thrones, a character that is completely different to the one she takes on in Me Before You. Her bubbly and chatty personality was the light of the film, just like it was in the books. However, I was disappointed by Sam Clafin’s portrayal of Will Traynor. I mean, I have never acted as a quadriplegic and I will never be qualified to act like one (or any other disability) unless I were one, but I guess this is one of the issues that will always remain controversial. I’m sure quadriplegics have as much to complain as pro-lifers have regarding euthanasia. To be honest, after watching the film, I can now see why so many people rose in rage against the film. 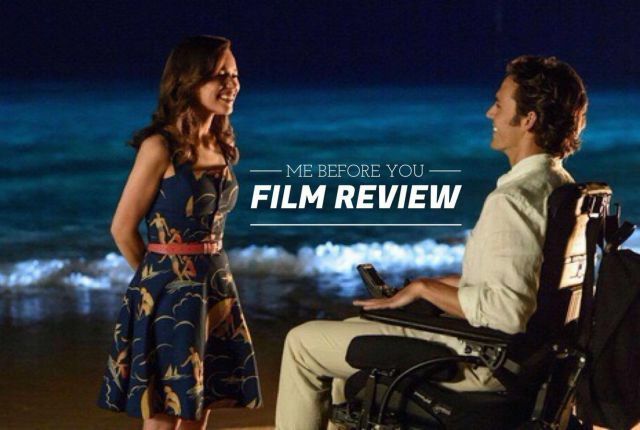 Unlike the book, the film does kind of romanticize Will’s decision to take his own life because he simply doesn’t want to take on the challenge and ‘shame’ of living as a quadriplegic. It is very much seen as a degrading way towards quadriplegics, and other disabilities. In the book, the tone was quite different. The controversy of Will’s decision was discussed more thoroughly and intensely, highlighting how the people that loved Will were completely against his decision to do so, until the day came. The film was shot in the lovely town of Pembroke, Wales, which is an absolutely stunning and beautiful town – the kind that you would see in films. But then again, it seemed that everywhere the characters went to, the scenery was as high-maintenance as everywhere else. Louisa is from a lower-class (in comparison to Will), and though efforts were made to depict Louisa’s home and other places as such, it was all still too ‘perfect’. Louisa’s home was lovely, the cafe where she worked at felt warm and welcoming, her neighborhood was pristine, etc. While I was watching the film, however, I loved all this. I guess, subconsciously, I had imagined everything to be as perfect as the film showed. After all, it is kind of like a star-crossed love story.